It’s hard to change people’s perspective towards healthy food, particularly in Egypt where restaurants keep things very basic with choices like grilled chicken with sautéed vegetables – or quinoa salad when they want to get really creative. However, there are a handful of restaurants that have made strides in fixing healthy food’s bad reputation, one of which is Be Good To You – founded by fitness guru and BeFit founder, Ali Mazhar. Located inside Kattameya Heights’ Club House, BGTY has an indoor area with a very chill ambiance and a outdoor poolside area perfect for breakfast. Although it’s simple and airy, there’s lots going on in the indoor area; there’s a fixed high table with high chairs, casual tables with colourful random chairs, bigger tables with couches and a table with a buffet-like setup that has flavoured water, cookies, banana cake slices, juice bottles and more as, well as a juice bar. 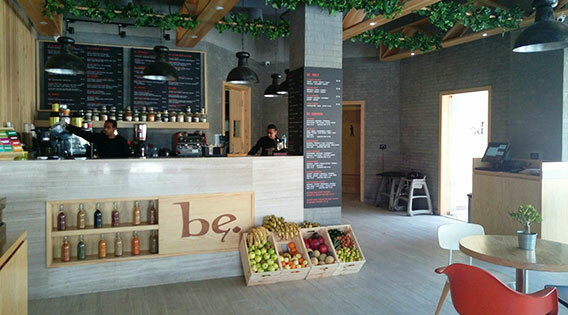 We loved the simple touches of wood with the grey flooring, the fruit baskets placed in front of the juice bar and the artificial plants used to cover the industrial ceiling; but the use of Be-infused branding and wall-quotes were a little much – ‘Be the change you want to see in the world‘, ‘Be creative’, ‘BeLieve in yourself‘, etc. The whole Be thing is in the menu, too, which is divided into lots of Be sections; Be a Morning Person is the breakfast section, Be Sweet for desserts, Be Warm for soups, and so on. Many of the items are gluten free, dairy free and vegetarian and are labelled with acronyms – GF for gluten free, for example. Starting our healthy brunch, we opted for Feel Good Fish Tacos (110LE) to share. 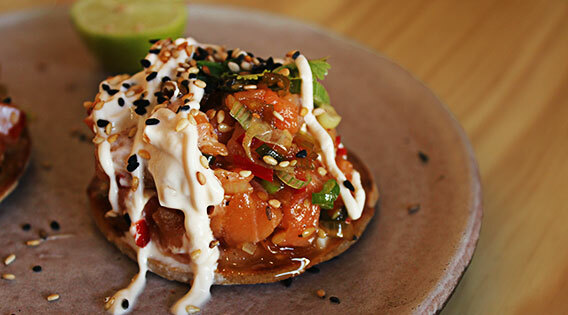 Two crispy gluten free tortillas are topped with a mix of fantastic fresh salmon cubes and thin slices of chili pepper that is tossed in a garlic and cilantro marinade, then drizzled with mayo and sprinkled with sesame seeds. While it wasn’t actually a taco, we loved how the flavours were very similar to a ceviche and an extra squeeze of lime made it official. This was the star of the brunch. 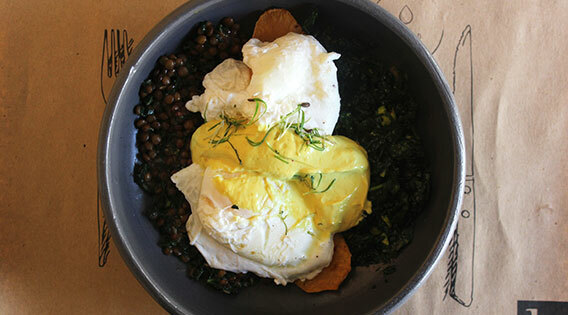 Moving to the dairy-free and gluten-free Skinny Benedict (88LE), the dish came in the form of well seasoned and perfectly cooked lentils next to two roasted pumpkin slices and kale pesto – which was more of a sautéed kale rather than a pesto-paste – and topped with three poached eggs and tofu hollandaise. While the presentation wasn’t the best, the messy-looking eggs had a perfect runny yolk and the zesty tofu hollandaise had exactly the same creaminess we look for in the regular one. Another gluten and dairy-free item we tried was the Chicken Sandwich (70LE). 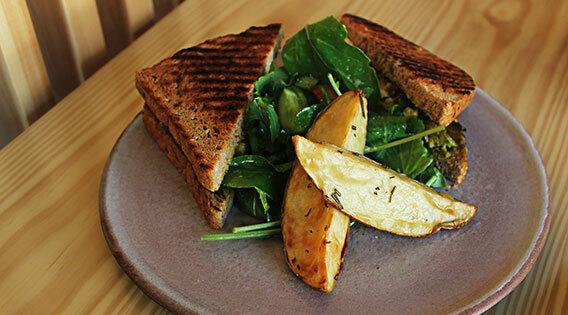 Served with simple yet perfectly cooked potato wedges and an arugula salad, the sandwich brought together pepper marmalade, more of that kale pesto, guacamole and very tender chicken. We wouldn’t complain about the sandwich so much if we were dieting, but, overall, it needed a lot of seasoning, bolder flavours and more chicken. 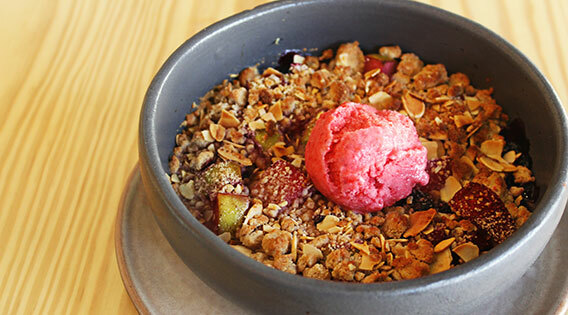 When it came to desserts, the first thing we tried was the Apple Almond Crumble (55LE); a mixture of slices of roasted apple that had a spot-on texture, mixed berries – which wasn’t mentioned on the menu but definitely added a great tart flavour – and, of course, almonds. The dish was also served with a homemade berry ice cream which tasted great, but had a bit of a chunky and icy texture; it was amazing in flavour, but the dessert lacked sweetness overall and wasn’t the best option for satisfying any sweet tooth cravings. We also tried the Be Smoothie Bowl (55LE). 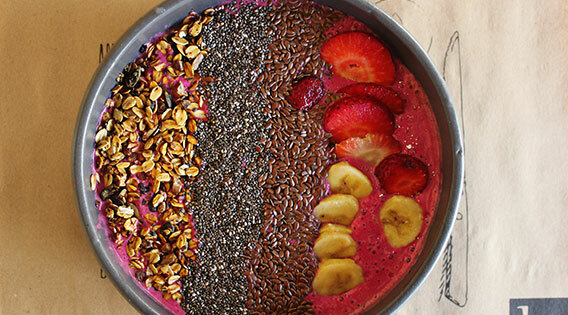 This Instagrammable bowl consists of a beetroot, fruit and Greek yogurt smoothie that had a spot-on sweetness, topped with fresh strawberries, semi-frozen bananas which added an ice cream-like texture, chia seeds, flax seeds and granola – now that’s a sweet tooth satisfying dessert. Chia and flax seeds are rarely found in Cairo kitchens, but it we loved the sweet and nutty touches it added. If any restaurant is going to make Cairo like ‘healthy food’, then Be Good To You is as good as any – in fact, they do a great job. Although the prices are a little steep, we’d definitely go back for the chilled atmosphere, the fish ‘tacos’ and that delicious smoothie bowl. Struggling to convince your children of the importance of healthy food? Be Good To You has a special kids menu. It makes eating healthy a whole lot more bearable. Light on calories, heavy on prices.